Project partners Lucy.D, supported by Philipp Hornung, created an installation for the Rado Award 2015, using the Robotic Woodcraft robot for cutting out the complex, central pieces of their design with high accuracy. “This Installation is inspired by the philosophical theory of prolongation and compression of time. 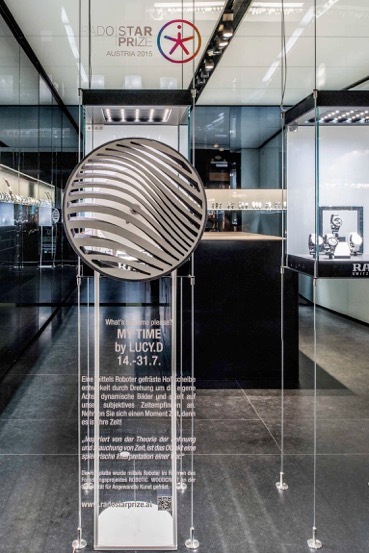 The object invites the spectators to think about their personal time”, the two designers of Lucy.D describe the idea behind the installation. 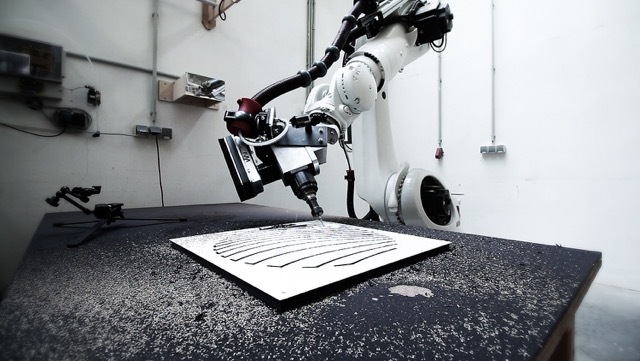 The wheel is milled with the robot and is turning around its axis – by its rotation three dimensional images occur. We are currently collaborating with a team from TU Vienna’s Institute for Structural Design and Timber Engineering (project leader Baris Cokcan) towards realizing a wooden pavilion structure for an upcoming exhibition. 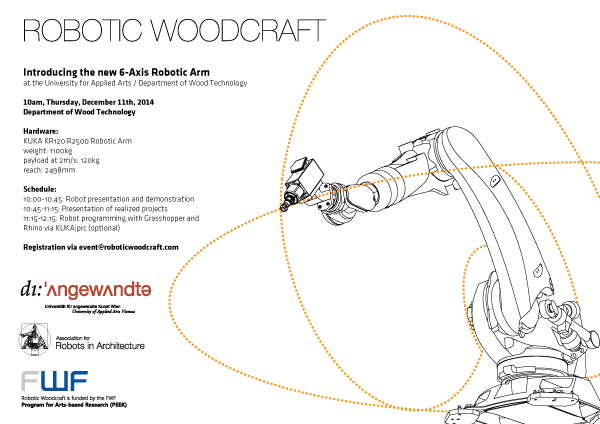 As part of the Angewandte AP lecture series the Robotic Woodcraft Consortium is holding a lecture on May 6th, 5pm at HS3 at the University for Applied Arts! 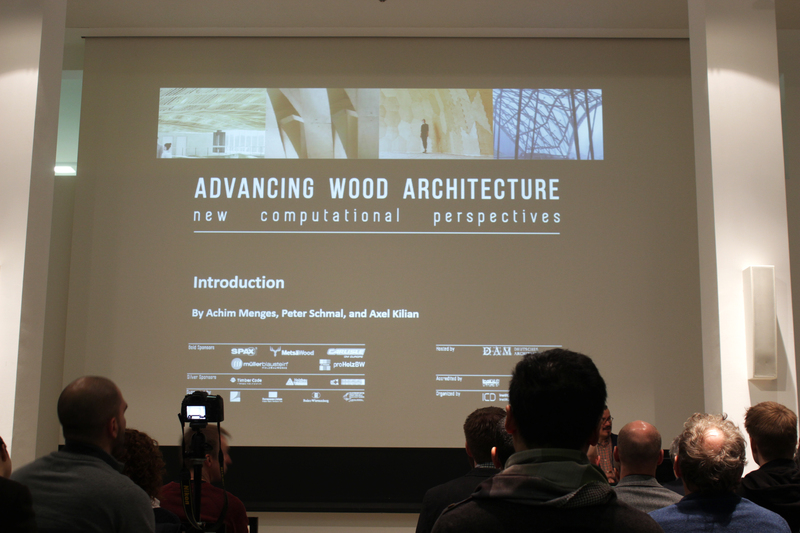 Recently, a team from the Robotic Woodcraft project attended the conference on Advancing Wood Architecture, hosted by Achim Menges of the University of Stuttgart. 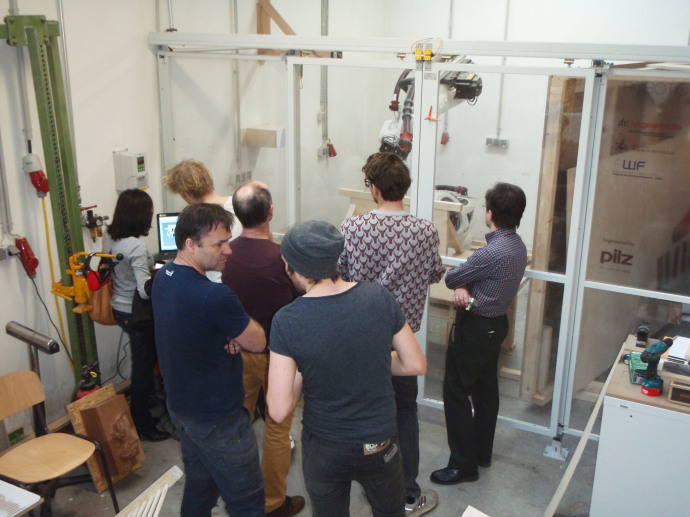 As part of the European Robotics Forum that took place this week in Vienna, the Robotic Woodcraft project and the University of Applied Arts Vienna offered a LabVisit that took place on the evening before the conference-kickoff. 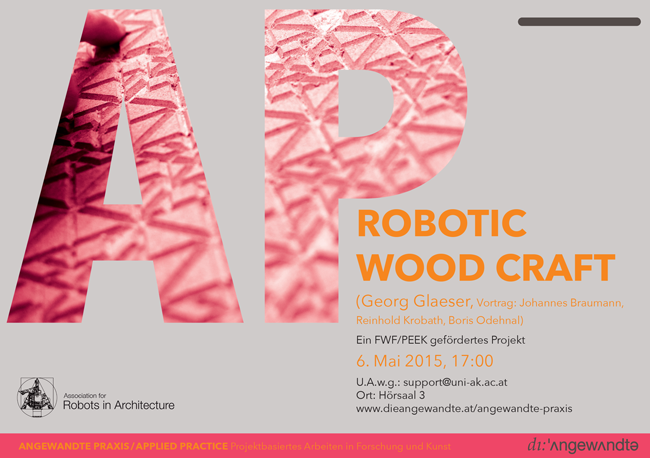 ERF participants could visit the Austrian Institute of Technology, the RoboLab at FHTW and the Robotic Woodcraft lab. As part of a press conference at the University for Applied Arts, the head of the university, Dr. Gerald Bast, led the assembled journalists to the Department of Wood Technology to showcase the newly acquired KUKA robotic arm. 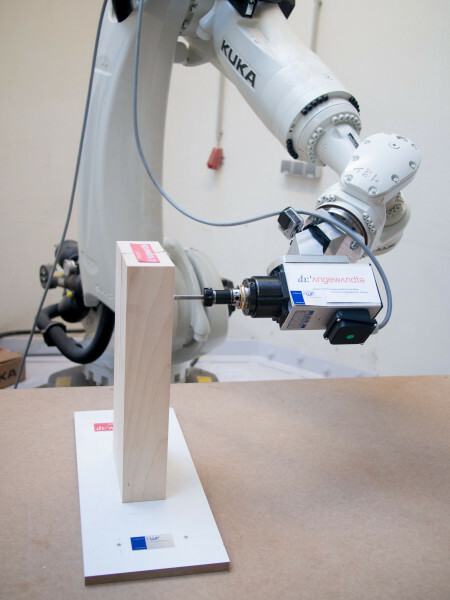 The Robotic Woodcraft team presented him with his likeness cut into laminated wood, realized through a custom-developed parametric design script. 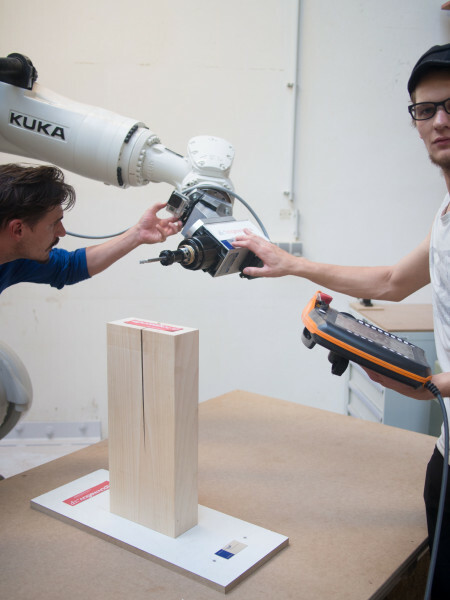 At the end of May, KUKA delivered a brand-new KUKA KR120 R2500 Quantec in RAL9002 “grey-white” to the Robotic Woodcraft project at the University for Applied Arts Vienna. 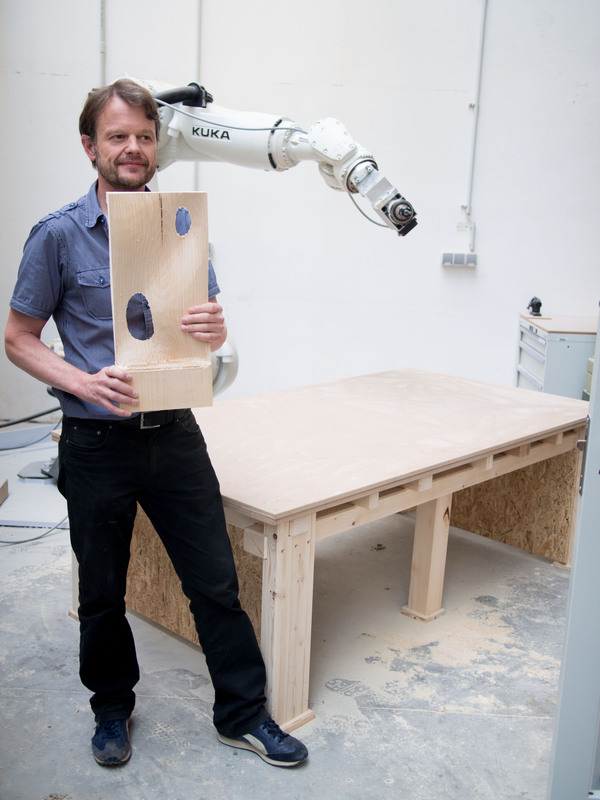 The project has greatly evolved from its humble beginnings when the robot was standing lonely in a corner of the wood-construction workshop. 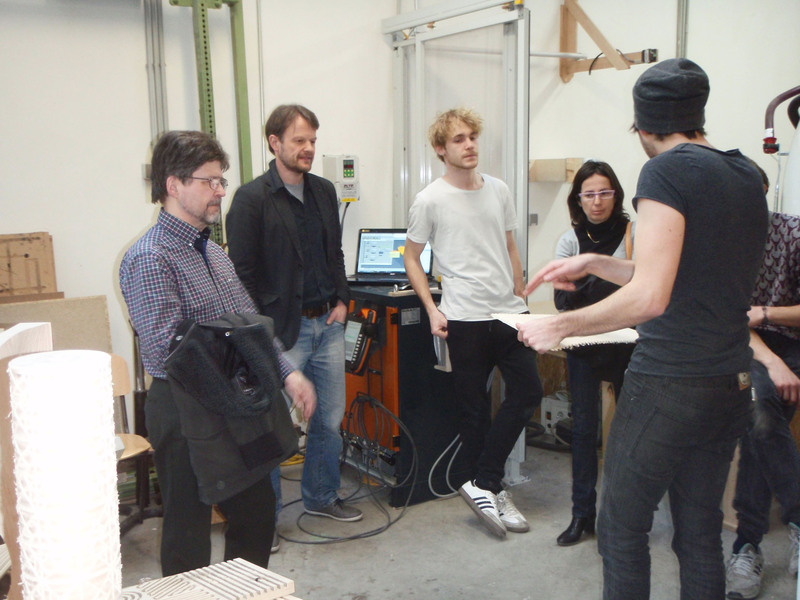 Since then, a huge amount of knowledge has been transferred from the wood-experts to the robot-experts and the other way around, with highly engaged students now already realizing parts of their diploma thesis using the robot’s multi-axis milling capabilities. As part of an inter-universitary cooperation, Robotic Woodcraft supported the robotic fabrication of the “Addition” wood pavilion. Designed by students of TU Vienna’s Institute for Timber Construction (Prof. Winter) under the guidance of Baris Cokcan, the pavilion was to be built in a extremely short timeframe in order to be ready in time for an exhibition at the AZW architecture center, located in Vienna’s famous Museumsquartier. One of the main challenges was the multi-axis milling over several hundred knots at a low budget. 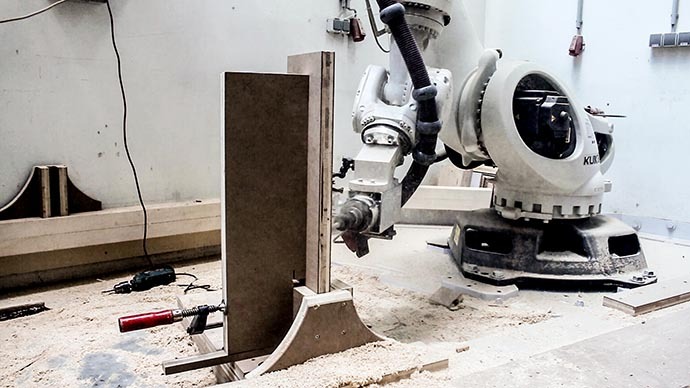 After generating the robot code using Grasshopper and the Association for Robots in Architecture’s software KUKA|prc (parametric robot control), two KR16s worked in tandem to precisely mill the wooden elements. Just in time for the semester break our milling spindle has arrived! While the setup took us some time – in the age of 50EUR smartphones, configuring an expensive inverter via four buttons and a 5-digit display is… frustrating – we were still done faster than anticipated and had the chance to mill a first piece. Fellow robot enthusiast Philipp quickly designed a surface in Rhino that we then prepared for fabrication via SprutCAM and KUKA|prc. And while the final result may not be perfect yet, it turned out really fine for a first day with only very loosely calibrated tools and workflows that haven’t yet been finely tuned. Thanks go out to Tom for providing electro-technical know-how, Philipp for the ultra-quick design, and of course to our student assistants Sebastian and Georg.